Venezuela's President Nicolas Maduro announced $6 billion in Russian oil and gold mining investments in his crisis-wracked South American country Thursday, after talks in Moscow with Kremlin officials. The Venezuelan strongman is in Moscow to whip up support from allies to prop up an economy in freefall. On Wednesday, Russian President Vladimir Putin voiced support for the socialist leader after the pair held talks. "It's been a very long, intense couple of days of work," Maduro said after meeting investors. "We have guarantees of an oil investment of over $5 billion," as well as "gold mining contracts worth over one billion dollars," Maduro told Venezuela's state television VTV. He offered few details of the agreements, but said Russia's investment in one of the world's largest oil reserves would focus on joint ventures with Venezuelan companies, with the aim of increasing production by "almost one million barrels" per day. According to the Organization of Petroleum Exporting Countries, Venezuelan production plummeted from 3.2 to around 1.1 barrels per day over the last decade. In a video message on Twitter, Maduro indicated the agreements with Russia went well beyond oil and gas, stretching to wheat supplies as well as Russian expertise on weapons systems. "We also signed a contract to guarantee all the wheat -- 600,000 tonnes of wheat for the bread of the Venezuelan people," said an ebullient Maduro in the message. "Already guaranteed for 2019, and beyond." Hit by low oil prices, mismanagement, hyperinflation and the impact of US sanctions, Venezuela's economy has plummeted. Food and medicine shortages have sparked an exodus of some two million people. Maduro also announced Venezuela would benefit from a contract "for the maintenance and repair of the weapons system of the Bolivian Republic of Venezuela." "Russia and Venezuela, more united than ever!" Maduro said in the video, his fists pressed together. 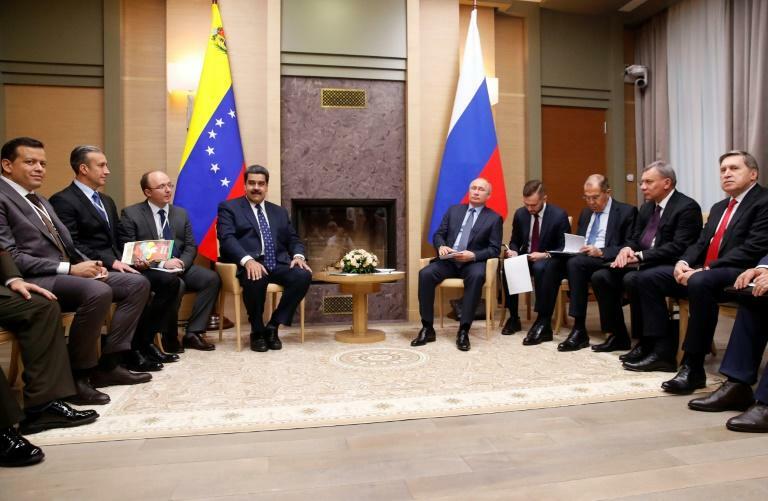 In a text message accompanying the video, Maduro said the meetings "with our brothers from the Russian federation" had made "a very positive assessment of the welfare of the Venezuelan people. "Thank you, people of Russia. Thank you, President Vladimir Putin." Hit by US and EU sanctions, and ostracized as a dictator by Western powers for his brutal suppression of the opposition -- many of whose leaders are in jail or exiled -- Maduro has recently reached out to Washington's foes in a bid to raise investment. Prior to leaving for Moscow, Maduro hosted Turkish President Recep Tayyip Erdogan for talks in Caracas, as well senior officials from North Korea and Iran. Russia and Venezuela enjoy a long history of ties and Maduro's predecessor Hugo Chavez, known for his passionate tirades against the United States, was a welcome guest at the Kremlin.